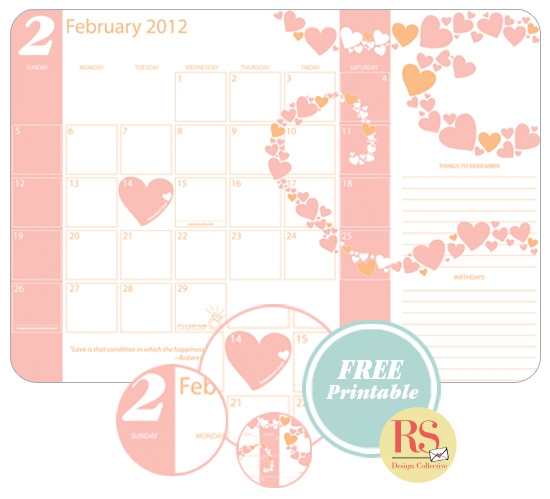 It's here again folks, our FREE monthly printable calendar! We hate to be obvious, but Valentine's Day is too much of an awesome day to ignore, so this months calendar is all hearts and love inspired. If the thought of that makes you sick, download it here anyway. We have no doubt it'll change you mind! 04 February 2012: Durban's most happening market, the I ♥ Market is on. Be sure to look out for our round up post on the event. 15 February: Music biggest night, The 54th Annual Grammy Awards. Ruby will be there to document all the interesting bits! 26 February: The 2012 Oscars - the event that the Golden Globes wishes it was. Stay tuned for our round up.